A bad witch's blog: Does it Matter if I Only Have White Candles for a Spell? Does it Matter if I Only Have White Candles for a Spell? The other day someone emailed me with a question about candle magic. They said they had cast a spell at the full moon, but only had white candles available to use - did it matter? 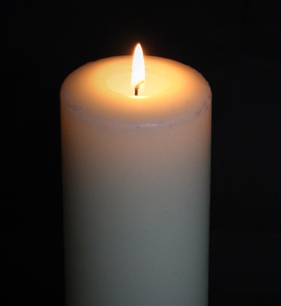 My answer was that it is always alright to use white candles, or plain beeswax candles, for candle magic. Although using a colour that symbolises whatever you are wishing for can help you visualise your intention, it isn't essential. After all, coloured candles have only been widely available since the mid 20th century. Before that, witches used plain-coloured candles perfectly effectively. However, if you really do want to add some colour to your magic and don't have a candle that shade, perhaps you have a candle holder or tea light container of the right colour? You could also put some flowers or crystals of an appropriate colour on your altar (or kitchen table) when you cast your spell. Or, you can write down any words you are going to say in coloured ink, a felt pen or colouring pencil on a sheet of writing paper, read them out aloud and then place your candle holder on top of that and let it burn down. Do keep an eye on it to make sure the paper doesn't catch light though. If you have any other questions about candle magic, email me at badwitch1234@gmail.com. My book Pagan Portals - Candle Magic, can be ordered from Amazon, Treadwell's or The Atlantis Bookshop.